Banana Republic has a Friendsgiving event, online only, ending tomorrow. You can take 40% off your purchase, with some exclusions (BR Pick, BR Monogram, cashmere, leather), using code FRIENDS. This code also applies to Gap and Old Navy. 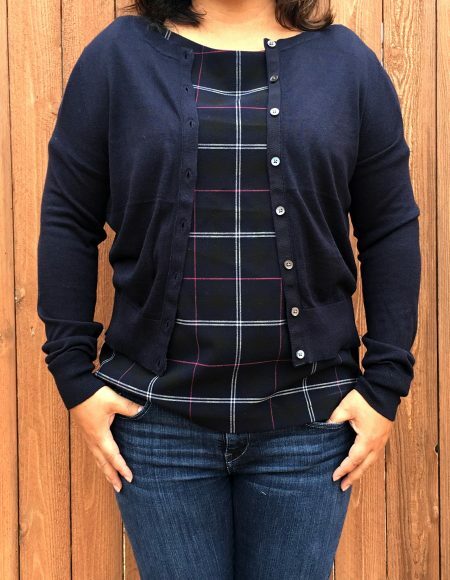 This merino cardigan looks to be sold out online but I found this in-store on the sale rack. 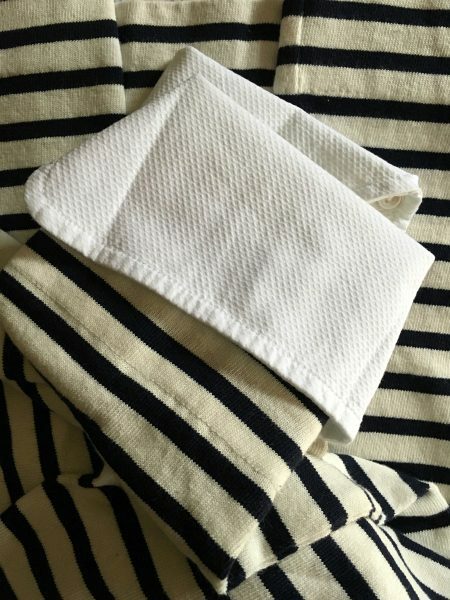 I already have a merino cardigan from J.Crew but it’s v-neck and I wanted something a little more classic and cropped. The medium is a good fit though the sleeves are pretty long, as you can see by the bunching at my wrists. 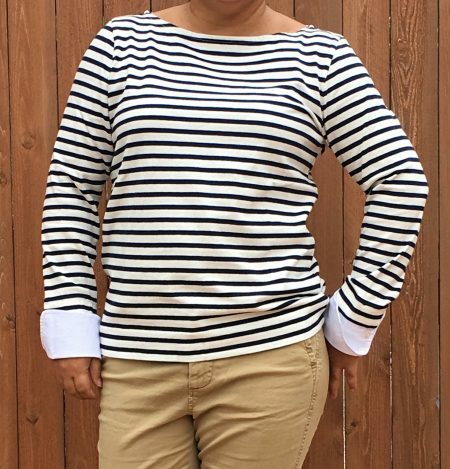 The neckline is also a little wider than the standard crewneck of J.Crew’s Jackie Cardigan. I was drawn to the puff-sleeves on this top, as well as the length of the sleeves. They are long enough to cover my arms but don’t quite hit the elbow; not too short or too long. When I saw this in-store it was styled with this purple blazer, which I thought was odd. 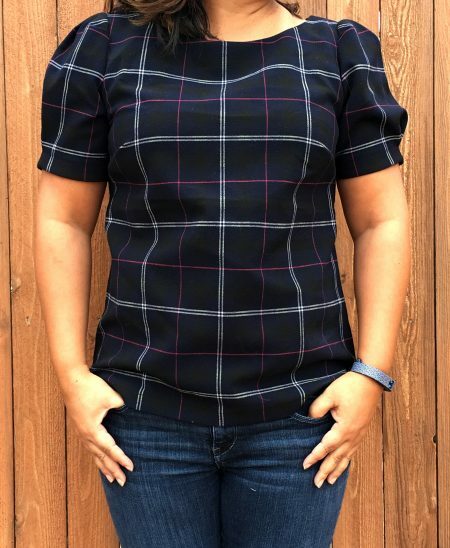 I thought what is actually a bright pink color in this plaid top was red. But now that I know this is pink I can see wearing this top with my pink houndstooth heels. This is a poly blend that feels a little like wool while the pink version is 100% poly. This also comes in a tee. It runs TTS. Here are a few more of my picks for this Friendsgiving sale. 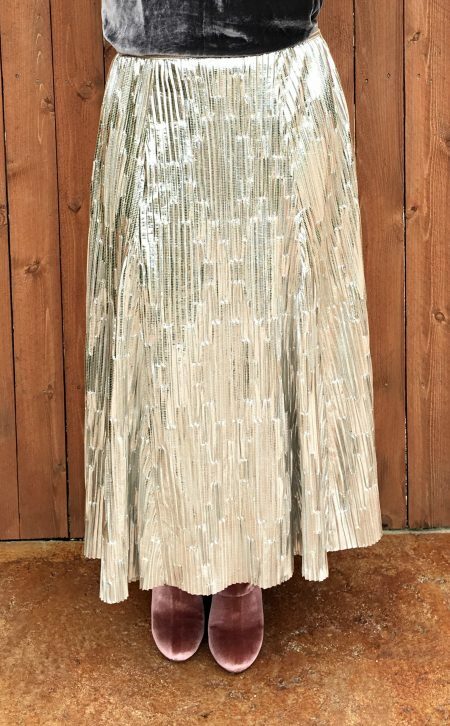 Banana Republic has also launched their Holiday Collection so you’ll find some great options for upcoming parties like this sequin skirt, tuxedo dress or these heels. This FRIENDS sale ends tomorrow. J.Crew’s latest promo is SHOPNOW/SHOPCARD. You can take 25% off your purchase with SHOPNOW or 30% off if you have a J.Crew Credit Card, code SHOPCARD. There are a few exclusions but most of the new arrivals as on promo, which is great if you are already shopping for Christmas gifts. I couldn’t resist just a couple of things that will help me transition into what we call Fall around here. I liked the concept of this tee, with the piqué cuffs. But I was disappointed when I saw the Ivory/Navy color in person. The cuffs are white and I don’t really like that. I know they are supposed to contrast but the ivory is really creamy. I would have preferred the ivory in the tee be a little lighter. The fit is a bit off for me. The neckline seemed loose and would probably, eventually stretch. The body was loose as well. The cuffs covered my hands if I didn’t roll them up. I like the outfit as a whole and will use another striped tee I have to recreate this look. I cannot believe I waited so long to try these pants in a Petite. 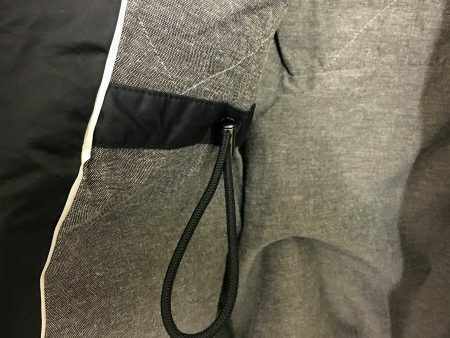 I’ve finally found a cropped pant! They are a little loose in the front. I have the Sammie in Polka Dot, which wasn’t offered in a Petite. I would like to get another pair and wish these had been offered in navy or black. I don’t see myself wearing any of the other colors offered. 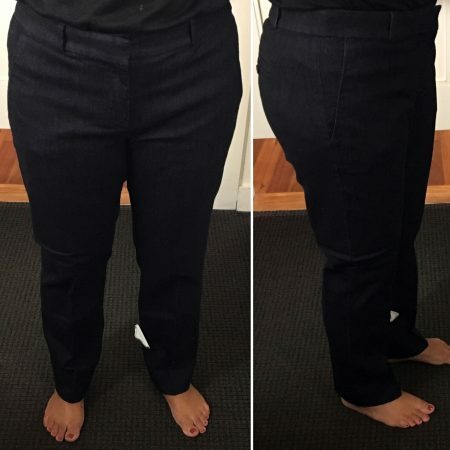 As far as sizing, I would normally get a size 29 so I’m really happy the 30P worked out and fit almost like the 29. I’ve been stalking these since they showed up online. I just couldn’t bring myself to pay full-price for them knowing I they wouldn’t be a daily or weekly shoe. But at 50% off $100, I happily ordered them in a size 7. They run TTS and the heel doesn’t feel too high that I would be uncomfortable wearing them for a full day. Doesn’t mean I will chance that though. There are still some sizes left and they are still 50% off. And here are a few more of my picks that are an additional 50% off with SHOPNOW. I’ll chance wearing the Leopard Bow Sandals through Fall as long as the weather allows and then put them away for Spring. I also picked up the Tipped Lightweight Wool Jackie Shell. I plan on wearing it with the Perfect Shirt in Foil Dot from last year. Since I had that I didn’t get the Ruffled Popover version. Are you shopping the SHOPNOW sale? I hope to have some in-store reviews for you next week but the closer we get to holidays, the busier my weekend schedule is. Do you have those times where you have returns but when you get to the store you end up finding something else to exchange it for? I know I shouldn’t expect it, but when making returns I usually go with the mind-set of “in-and-out”. That never happens though. It’s like someone says “Squirrel!” and there I go veering away from my destination, the register to process my return. I “squirreled” my whole Saturday, finding one cute thing after another. And don’t get me started with Target. I’m lucky I got out of there spending less than $100 that day. And what did I find at Tar-jhay? A lovely faux fur vest caught my eye. I’ve passed on them over the years but this one seemed to really peak my interest for some reason. I thought the Medium looked too big but the Small was sold out so I tried it on anyway. It fit really well. I think the small would have been too tight in the armholes so the Medium was a good choice. 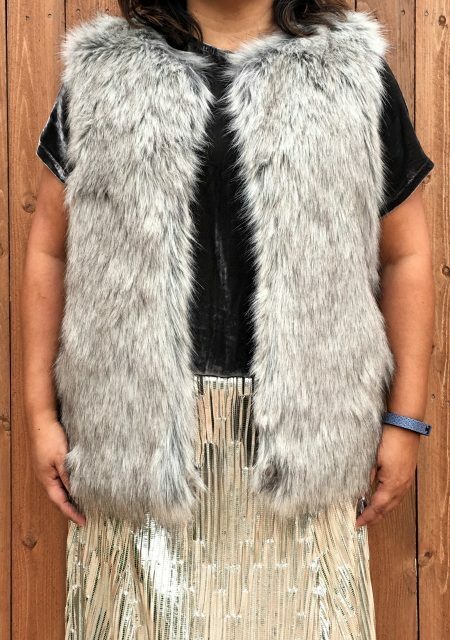 I might wear it with this Maeve metallic midi skirt but I also have this shirtdress from Tory Burch that had popped into my head when I saw this fur vest. Next, I headed to the mall where I found the Maeve Eclat Midi Skirt. It was styled in the window and I couldn’t resist it. You know I don’t have any midi skirts but this one just seemed so perfect for Fall and the upcoming holidays. It was styled with this sweater, which is 30% off today. I bought and Medium and it fits TTS. 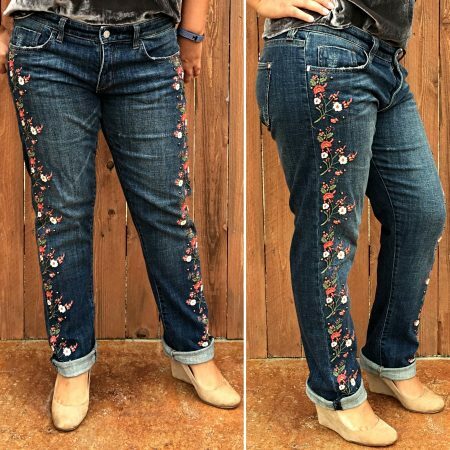 I also bought these Pilcro embroidered jeans. I have been lusting over them for some time now but could never pull the trigger, since shipping is just so expensive. And the reviews have sizing all over the place. But, I was lucky on Saturday because my store had a return, in a size 29. I grabbed them and immediately went to try them on. They fit great in the hips and thighs. I have worn them already and they have stretched some in the waist and booty but the thighs are still fitting well. I can see why sizing is off on these. I think a 29 Petite might have been a good fit as well, and would shorten the length a little. I will probably have to get these hemmed a little so they lay right. They are not as heavy as I thought they would be with the embroidery and light beading. I also tried on these bejeweled jeans and the sizing was really off on those. 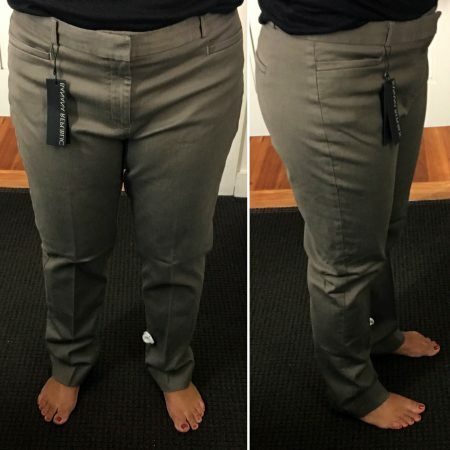 I tried on a size 29 and they were really really loose in the waist and snug in the hips and thighs. They also felt like they will stretch out as you wear them so they were a pass for me. 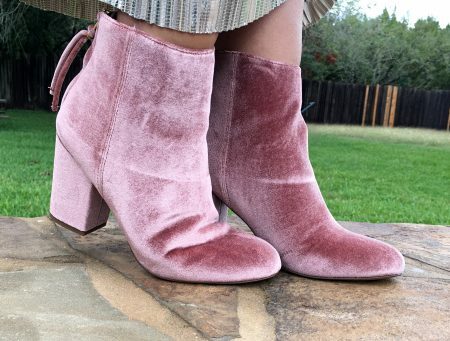 As I ventured my way to Madewell, I spotted these Mod velvet booties at Steve Madden. They are definitely a color I don’t wear, but I had to see them in person and try them on. They are new arrivals in store and pre-order online. They run TTS and I ended up with a size 7. They are out of my color comfort zone but I’m excited to style and wear them! 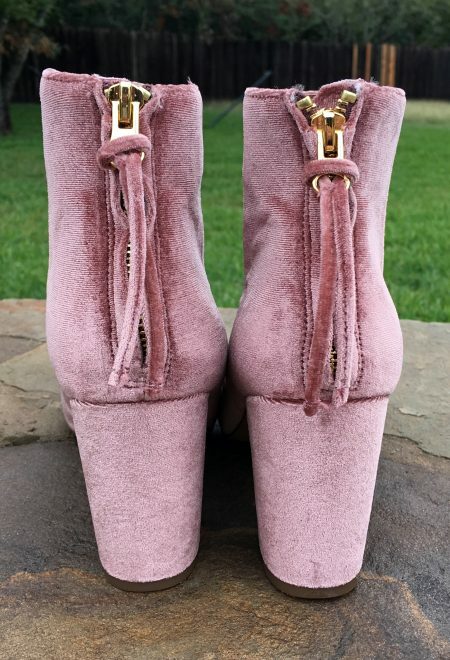 This pretty pink velvet was also offered in sneakers and heels. 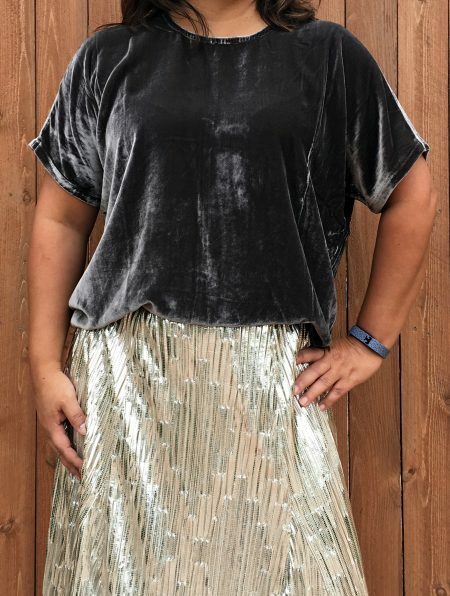 So, finally making it to Madwell, I saw this Velvet Bow-Back Top and thought it would be another great item for the holidays and evenings out. This is the Dark Metal color and it also comes in Distressed Stone and True Black. This runs really big. I considered sizing to a XS but I like the looseness of the Small. This is also a longer hem in the back. The bow is in the back, tied at the neck. I have several blazers this top can work with as well as some fancy pants. And, this top is so comfortable. I didn’t want to take it off! So that was my whole squirreled away Saturday. 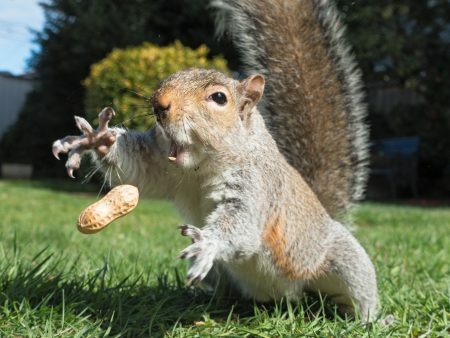 I’ve added several different options for you so you can “squirrel” through this post too! 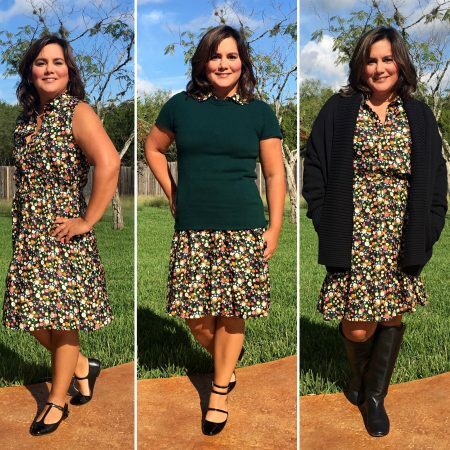 This week I’m styling the Ryder Dress from Tory Burch, taking it from Late Summer to Early Winter (at least here in South Texas). 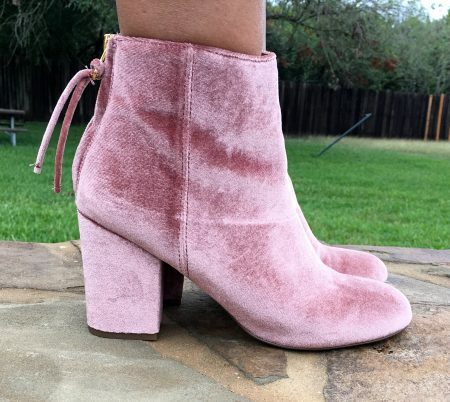 These were the shoes I ordered during the Fall Event and I’m so happy that I did. I ordered the size 7 and they fit TTS. I was worried that the strap wouldn’t be long enough since that has been the case for several other Tory shoes I’ve tried on. But this time, the strap was long enough and has a few extra holes. I’ve worn them a few times already and they are pretty comfortable.  The body of the shoe is leather and the toe is patent. The little flower blossoms are by the buckle. This blossom design is also offered in a ballet flat, a bootie and a tall boot. This was probably my favorite outfit of the three. I initially chose a cashmere cardigan in the same color but loved how the tee transitioned this from a dress to skirt. I also have the idea incorporate tortoise into this outfit by adding some opaque black tights, the Gemini Link Loafers and my Tortoise Flower Necklace (one, two, three). I cannot wait until it’s cold enough to break out the cashmere. I will probably add my black Lexington Blazer over this. This last outfit will be perfect for my work-from-home attire. I’ll be able to stay nice and cozy in this chunky sweater while still looking put together for my day “at work”. The waist on this dress is elastic so I think I do need to add a black belt. This will help keep the dress from riding up at the waist. I hope you enjoyed seeing how I styled the Ryder Dress. You can always see more items I’ve styled on my Tumblr. 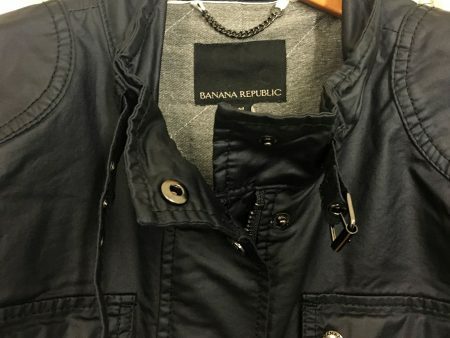 Banana Republic is having a Flash Sale today, online only. With code BRFLASH, you can take 40% off your purchase of $200 or more. And there don’t seem to be any normal exclusions, like leather, cashmere, Monogram, etc. Of course, I would immediately get the Suede Trench, if it weren’t so impractical for me. We have no real in-between from Summer to Winter and this is more of a Fall item. It’s suede so it won’t repel the rain. And it’s still expensive, with the 40% off. But it IS gorgeous. Oh well, see more of my practical picks for this Flash Sale. 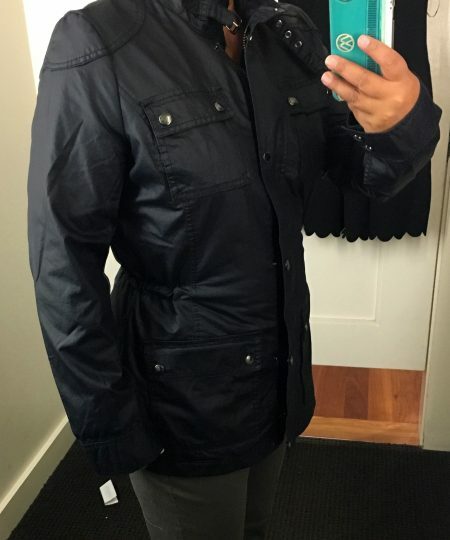 This is similar to the Downtown Field Jacket. It differs in that you can cinch the waist and there is also a buckle at the collar. It looks a little weird on me because I cinched it too tight but you can see how that can create some shape for you. Take your true size, as the Medium was a good fit for me, even though the sleeves are really long. 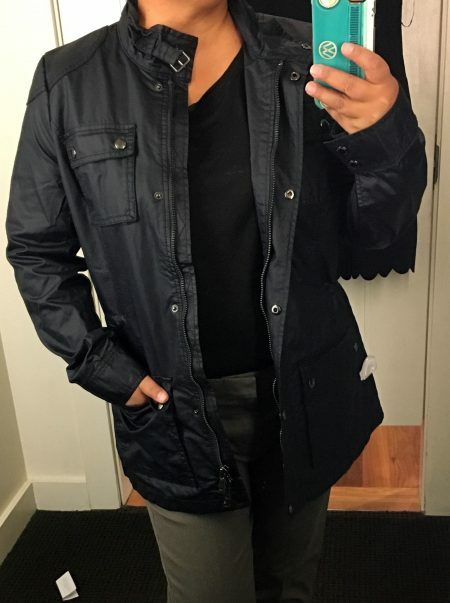 This jacket is lined in a soft jersey cotton. Size 8 seemed to be pretty popular in my store as there were few pants on the floor in that size. 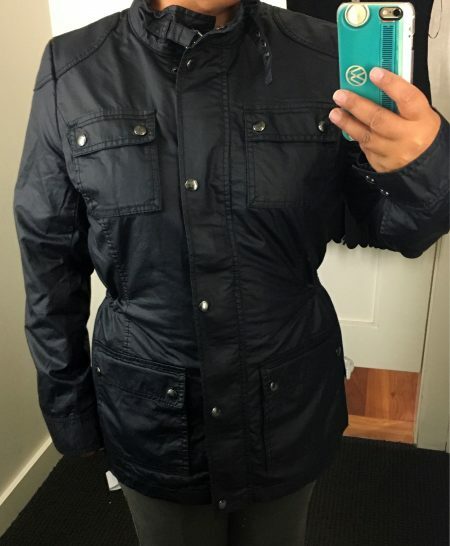 The store I go to also carries a limited amount of Petite items so I went up to a size 10 in the Avery Fit. From the fit of the 10, I could tell I needed either a petite 10 or a size 8. I like this windowpane with the subtle white stripes to form the windowpane print. 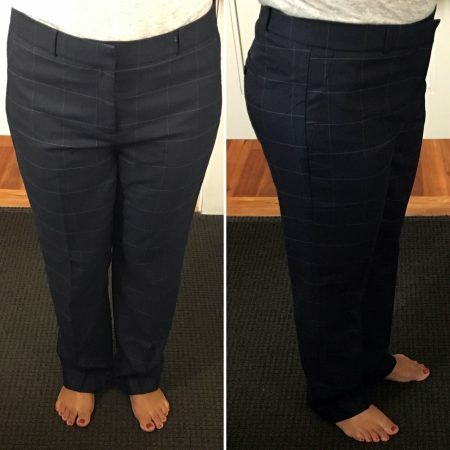 The Avery fit is a Tailored pant that is also supposed to be cropped. I do like that Banana Republic offers different fits for their pants in various colors, prints and material. 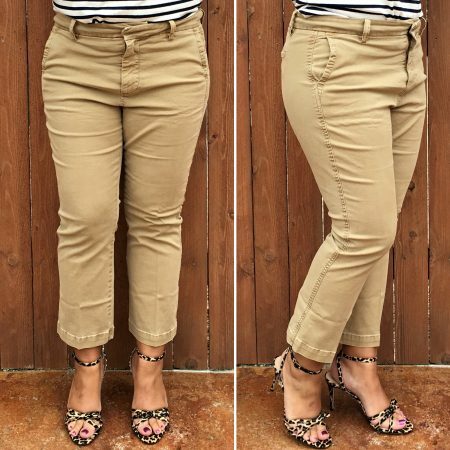 I really liked these Denim pants and they reminded me of the J.Crew Minnie Pant in Denim from 2010-ish. These are nice and tailored and fit well in the size 8. These do have both poly and spandex in them so they may stretch quite a bit after wearing them. I also worry that the darker wash denim will start fading after a few washes. Something to look out for with these. The Sloan-Fit are a slimmer fit and ankle length. I’ve had a pair or two of these in the past and always try to get them in the short length so that they are cropped on me. The size 10 actually fit well through the hips and thighs but were a little big in the waist and the knee. I’m not sure they’d shrink all that much after washing so I would go with a petite. I did like the material as it was thicker than slacks like the Avery Windowpane but still thinner than the Avery Denim Pant. The Pacific Taupe looks gray to me and not brown like the online image. I am sitting out this sale. Other than the Suede Trench there really isn’t anything I actually need right now. We are still in warm weather mode so it’s hard to think about Fall clothes.